Green roofs are springing up in the concrete jungle of New York City – plants growing on waterproof membranes on top of buildings – in all five boroughs. Considering the potential to reduce greenhouse gases, increase energy efficiency and capture storm-water runoff, this movement is understandable. “Most of this work is small in scale so far, but it should get us all thinking,” said David Smiley, assistant professor of architecture and urban studies at Barnard College. Green roofs are perceived as especially useful in New York because they absorb up to 70 percent of the rainwater that would otherwise drain away. The city – built on islands and bounded by two rivers — has long struggled with excessive runoff after heavy rainstorms that overwhelm the drainage system that overflow with raw sewage. Con Edison, the city’s energy supplier, pioneered urban greenery in 2008 by planting thousands of sedum on the roof of its building in Long Island City, across the East River from Manhattan. “We’re slammed,” said Marni Majorelle, who founded Brooklyn-based Alive Structures to teach New Yorkers how to convert their rooftops into gardens. “There’s a growing demand for green roofs from homeowners and developers. I see it as part of people’s plans – so many architects now include it. It’s a new chapter for New York.” According to a 2008 New York Times report on green roofs, New York City has 944 million SF of rooftop surfaces, but records of how much is used as rooftop gardens are limited. It lags behind Germany and other American cities such as Chicago and Seattle, where – as Dwaine Lee, a green infrastructure professional, said – green roofs were have been planted for years. New York is starting to catch up. “It will keep growing, because the cost is coming down and the manufacturers of roofs are getting into the game,” said John Coogan, of OCV Architects, which creates roof spaces, predominantly next to non-profit-making organizations in affordable housing units. It designed its first green roof in 2004 and has completed a dozen more spaces since. Some believe that green roofs are just the tip of the iceberg. Architect Vanessa Keith envisions an array of innovative ways to retrofit buildings – from roof ponds for cooling to electricity-generating water walls. “Perhaps the current dilemma, rather than being seen as a death sentence or a depressing indictment of wasteful society, can provide an opportunity to rethink and retool our existing way of life,” she said. 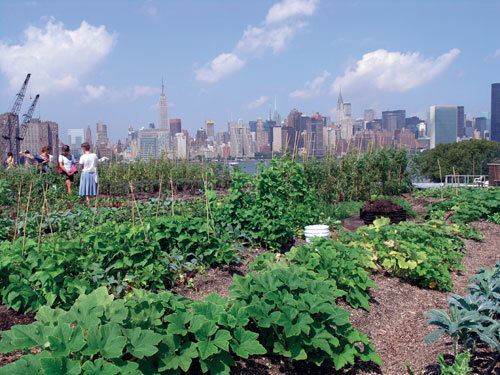 Several New York urban farmers are innovating with their rooftop gardens For example, there is the nearly one-acre Brooklyn Grange, Eagle Street Rooftop Farm, Gotham Greens, and the aeroponic growing system. An affordable rental building in the Bronx plans to open with a new rooftop commercial greenhouse, and the Brooklyn Grange will open a new farm on the Brooklyn waterfront to grow food and capture storm water, thanks to a grant from the city’s Department of Environmental Protection. To encourage building owners to convert rooftops to food production, the New York City Department of City Planning (DCP) released a proposed zoning text amendment that would exclude rooftop greenhouses on top of commercial buildings from the lot’s floor area ratio (FAR) and height limits. Several banks have found a new solution to the glut of foreclosed houses – many of them in poor condition. It’s the bulldozer. Bank of America (BoA) owns a glut of abandoned houses that no one wants to purchase. As a result, the nation’s largest mortgage servicer is bulldozing some of its most uninhabitable inventory. Additionally, Wells Fargo, CitiCorp, JP Morgan Chase and Fannie Mae have been demolishing a few of their repossessed houses. BoA is donating 100 foreclosed houses in the Cleveland area and in some cases will contribute to the cost of their demolition in partnership with a local agency that manages blighted property. The bank has similar plans impacting houses in Detroit and Chicago, and more cities tare expected to be added. 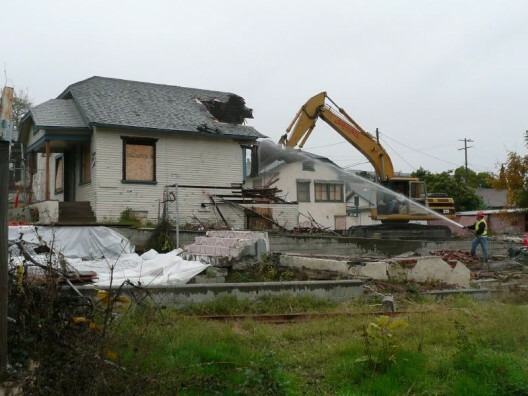 “There is way too much supply,” said Gus Frangos, president of the Cleveland-based Cuyahoga County Land Reutilization Corporation, which works with lenders, government officials and homeowners to salvage abandoned homes. “The best thing we can do to stabilize the market is to get the garbage off.” Detroit mayor Dave Bing is in the process of ” right-sizing” the motor city by razing entire neighborhoods. Some foreclosed properties are so uninhabitable that the bank is willing pay to have them destroyed. A bank spokesman said some in this category are worth less than $10,000. It’s going to rain. According to a study by climatologists at the University of Illinois at Urbana-Champaign and Texas Tech University, temperatures in Chicago will continue rising over the next century, largely due to human emissions of heat-trapping gasses. The strength of that warming trend and the impact it brings depends on the amount of future emissions produced by the city and the world. Katharine Hayhoe, a research associate professor in Texas Tech’s Department of Geosciences, co-led the team of more than 20 researchers along with Donald Wuebbles, professor of atmospheric sciences at the University of Illinois. The majority of climate scientists agree that rising global temperatures are changing rain patterns because of increased evaporation and more moisture in the air. They are less certain about how fast climate change is happening and how human disruption of natural climate cycles affects day-to-day weather. Another report from the National Wildlife Federation (NWF) concurs. More Extreme Weather and the U.S. Energy Infrastructure, The study details National Wildlife Federation how severe droughts, heavier rainfall events, changing snowmelt, and more intense tropical storms may cause significant disruptions to the nation’s energy grid, all while the existing system calls for upgrades. “Our hospitals, homes, and economy depend on an energy infrastructure that will be increasingly disrupted by extreme weather events related to climate change,” said Amanda Staudt, Ph.D., a NWF climate scientist and the report’s author. That said, the mayor-elect of Chicago is facing a mountain of problems, including high poverty levels in some neighborhoods; a budget crisis that could amount to a $1 billion hole; failing schools; a public transportation system in serious trouble; and a police force that is significantly understaffed. 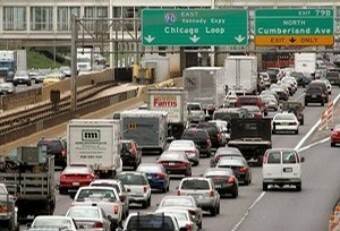 Additionally, Chicago’s business community and job-creation capacity were showing signs of distress even before the recession began; the 2010 Census shows that Chicago is losing residents; the costly parking meter fiasco has sparked strong reactions; and soaring property taxes remain unresolved. Lastly, long-term avoidance of resolving public-worker pension funds has put the city into a financial corner. In his victory speech in Chicago’s Plumbers Hall, Emanuel was optimistic about his ability to resolve the city’s problems. “I am determined, with your help, to meet our challenges head on and make our great city even greater,” he said. 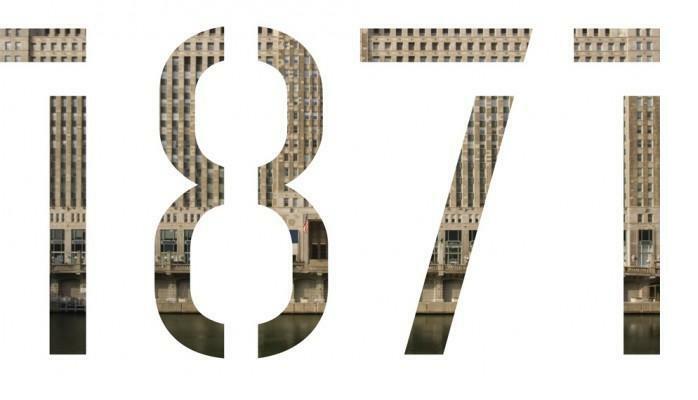 Before Tuesday’s historic election to replace the retiring Mayor Richard M. Daley, Emanuel’s poll numbers showed him winning less than 50 percent, which would have necessitated a runoff election in early April. Instead, Emanuel won 55.2 percent of the Tuesday vote. Runner-up Gery Chico received 24 percent; Chicago City Clerk Miguel del Valle won nine percent; and former Senator Carol Moseley Braun won just under nine percent of the vote. Rahm Emanuel will be inaugurated as Chicago’s mayor on May 16. He has huge shoes to fill and a daunting task ahead. It is our belief that he is an extraordinarily seasoned politician and a sophisticated operator and a worthy successor to Mayor Daley. We wish him well.